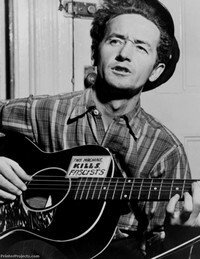 Woody Guthrie Posters - Portrait of Woody playing the guitar. This large black and white picture fills one entire sheet of paper. Suitable for inkjet or laser printers. Requires the Adobe Acrobat Reader, which is available as a free download here.